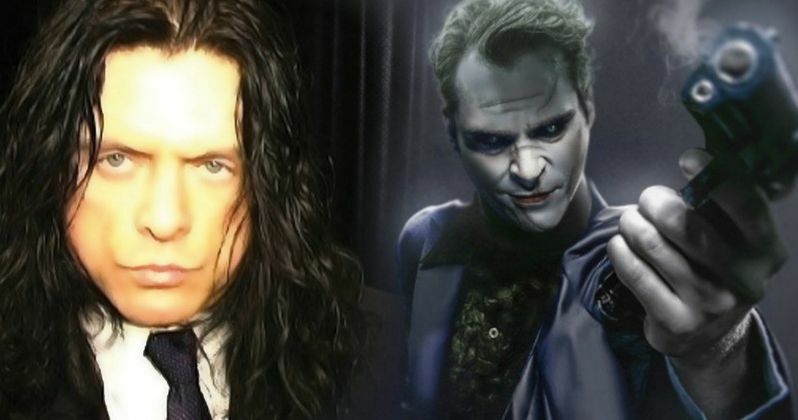 Tommy Wiseau thinks that he would be a better Joker than Joaquin Phoenix and has reached out to director Todd Phillips about the role. Leonardo DiCaprio was rumored to play the Clown Prince of Crime in the new Joker Origin Movie, being produced by Martin Scorsese, after it was revealed that he met with Phillips 4 times to talk about the role. But new report suggests that Joaquin Phoenix is now the frontrunner for the new Joker movie. But would The Room's Tommy Wiseau be a better choice than Phoenix and DiCaprio? Tommy Wiseau thinks he's the right actor to portray the Joker in Martin Scorsese and Todd Phillips' new origin story and he might be right. Late last week, Wiseau hit up Phillips on social media when it was announced that Joaquin Phoenix is the frontrunner to play the character. Phoenix is an Academy Award nominated actor and excitement began to spread amongst DC fans with the idea of the actor taking on the role. Fan art was promptly drawn up, which stoked the fire even more. However, Tommy Wiseau thinks he can do a better job. The Room is considered to be the Citizen Kane of horrible movies, but Tommy Wiseau's role is perfectly unhinged and he could make a fine Joker in the new origin movie. The DCEU is looking to shake things up with a new DC Films banner that will make the standalone movie and Wiseau could be just the man to go in and turn things around after the failure of Justice League. Now all we need is BossLogic to whip up some artwork really quick to see what Tommy Wiseau would look like as the Joker. All kidding aside, Tommy Wiseau will definitely not be playing the Joker in Todd Phillips' upcoming origin movie. But, it would be equally interesting to see Wiseau tackle the movie on his own, like he did with The Room. Maybe that's the direction that the actor should take since it could be a few years before we end up seeing this new Joker origin movie put out by Warner Bros. Tommy Wiseau could make his own version, with his own money, and probably even get a bunch of A-list cameos, thanks to James Franco's The Disaster Artist. Although Tommy Wiseau won't get to play the Joker in the Todd Phillips' upcoming movie, he may end up getting a cameo of some sort. Maybe he can play a henchman or a football player in a role without dialogue. For now, Joaquin Phoenix is the frontrunner to play the Joker in an origin story that will reportedly take place in the 1980s and be the first movie to be released under the new DC Films banner. Let's hope that Tommy Wiseau is included in some way when production starts. You can check out the tweet that started it all below, courtesy of Tommy Wiseau's Twitter account.